GSRTC Recruitment 2019 Notification for 27 Account officer, Divisional statistical Officer, Security Officer, Assistant Store Officer, Divisional Mechanic Engineer, Divisional Traffic Officer, Divisional Transport Superintendent (DTS) / Depot Manager A (class-2 old), Divisional Mechanical Supervisor (DWS) / Depot Manager A (Mechanique) / (Class-2 Old), Assistant Account Officer, Deputy Engineer Vacancies is released. All the interested Candidates, from the Gujarat State, can proceed to apply, for it. 27th January 2019 is the closing date. By that Date, all the interested candidates, have to submit the application form, that too in the Online Format. Now, before proceeding to apply, for the GSRTC Recruitment 2019 try to check the above table. That table is going to provide a complete overview of the Requirements and all the important information. Now, the Job location for the hired candidates will be across the Gujarat State. Now, the officials are even paying the good salary. Also, the Candidates, have to clear the Selection Rounds. Then only the Officials will accept candidates. Account officer Postgraduate or Graduate in Accountancy. Deputy Eng,(civil) Structural Engineering Degree. Like all the Details, about the GSRTC Recruitment 2019? Well, then find more such Latest Updates on our site. GSRTC Recruitment 2018-2019 Notification is issued for the 2930 Conductor, Driver Vacancies. Now, this Advertisement is attracting a lot of attention from the people who are currently looking for the Government jobs in Gujarat. Now, in this post, we are going to put all the information that is given officially in the advertisement by the Gujarat Road Transport Corporation Officials. So, accordingly, there are 1997 Conductor Vacancies and 993 Driver Positions. Now, please take a lot at all the requirements of each post. And then proceed to apply, as per your interest. Apparently, the officials of the GSRTC are going to accept the applications from the people on 1st March 2018. Therefore, all the people who are interested and willing to apply can check the details. And then proceed to apply by submitting the Application Form on or before the Final date which is 31st March 2018. So, in recent GSRTC Recruitment 2018-2019 Notification by the officials, they have decided to hire the people for the available 2930 Vacancies. For this purpose, the Gujarat RTC Officials are looking for the eligible and efficient persons. And for this reason, they even set some requirements. Which by the way all the applicants should fulfill if they want their application to be considered. Please remember that the applications will be rejected even if the candidates submitted before the closing date, yet lack of having the required eligibilities. So, as per the information that is mentioned in the official GSRTC Recruitment 2018-2019 Notification, applicants should have finished their 10th Class or 12th Class from any recognized institute or Board in India as the educational qualification. Also, remember that the officials asked the contenders to have Driving Licence for light & Heavy Vehicle with 4-year experience For Drivers position. Try to get some basic details from the table which we have placed above. You can check the important points from the official GSRTC Recruitment 2018-2019 Notification. We have tried to include most of the details. So, as mentioned earlier in this article, those people who are willing to apply for the GSRTC Recruitment should have all the qualifications correctly. Now, take a look at the requirements of the Age Limit. So, the officials of the Gujarat State RTC mentions about the Age limitation and Age relaxation in the official advertisement. The Minimum Age is 38 years while the Maximum Age is 45 years. Contenders should observe that this is just an outline. And this Age Limitation is going to change for both positions and for both Males and Females. Now, all the contenders are requested to check the advertisement for the age relaxation. So, after the age limit and educational qualification, all the people should be aware of the application fee. As per the information that is given in the official GSRTC Recruitment 2018-2019 Notification those people who are applying should pay the application fee, as of on time of submitting the application fee. If not all such applications will be rejected along with those submitted after the last date. And those applications not having the correct requirements as given in the advertisement. As per the GSRTC Recruitment 2018-2019 Notification, people who are applying should pay Rs.250/- as application Fee. Please check the official site or the advertisement twice. This is to avoid the Misleading information. Now, all the information on this page is to refer. And this is officially available on the official site of GSRTC. Therefore, if you are having any second thoughts, check the Gujarat State Road Transport Corporation at ojas.gujarat.gov.in. So, this is a good chance for the people in search of the Government Jobs. Therefore utilize this chance. So, now coming to the important aspect of this Recruitment, Selection Rounds. All the people who are applying for this GSRTC Recruitment 2018-2019 should be well aware of the Selection Process. Because the officials of the GSRTC are going to choose the best and hardworking contenders. And this is through Written Test and Personal Interview. Now, those people who are eligible will have to attend these rounds. You will go to the next rounds in the process only if you clear the before one. Therefore prepare well and do good. So, as mentioned in the above sections, all the people should clear the Recruitment Rounds. Remember that if any of the details that you gave, you will be terminated. And you will become uneligible to continue next rounds. Therefore, keep this in mind and apply. Now, all the officials of the GSRTC are even offering good amount as the salary. All the people who will clear the rounds will get the job. And therefore, they receive this amount monthly as the salary. According to the information in the official GSRTC Recruitment 2018-2019 Notification, selected people will get Rs.10,000 per Month. Along with this will also get Grade pay. Now, down in the next sections, you will find the pointers about the Post Wise Vacancies, Requirement of Education, Age Limit, Age relaxation, Selection rounds, Application fee, Salary and more other details. Also, we gave some steps. And these steps will help the aspirants to apply for the GSRTC Recruitment 2018-2019. Therefore, check them and follow them to get an idea. Remember that you need have had all the qualifications correctly, as of on time of applying. If not the officials of the GSRTC are going to reject such applications. Now, many of the people might be wondering about the information related to the GSRTC Recruitment 2018-2019. But many of the candidates cannot find the correct information. Therefore, for all such people, here we are creating this new post, with the total data. 10th Class or 12th Class from any recognized board. And should have the Driving license for Heavy and Light Vehicles. 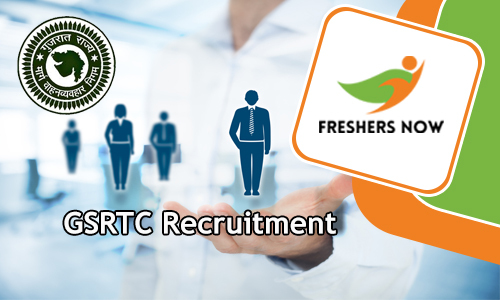 Our team from the Freshersnow.com hope that you are all satisfied with the details given about the GSRTC Recruitment 2018-2019 on this page. For more such important notifications and Updates, follow our site daily without a miss.